Baumer has expanded its XF series of VeriSens vision sensors with models using the multiple award-winning ColorFEX technology, which for the first time simplifies color checks in a compact design with integrated lens and lighting. In addition, with release 2.10 of the Application Suite, a software update has been made available that meets numerous customer requests for encrypted data transmission and function extension. The new models and the software package will be available from the end of 2018. The 700/800 color models of the XF series allow the cost-effective combination of color checks, code reading (1D, 2D codes) and reading and verifying plain text (OCR/OCV) in one compact device. With the intelligent ColorFEX 3D color assistant, object colors and their shades are automatically identified and visualized in 3D. The vision sensors reduce the complexity of reliable color differentiation applications to a simple, interactive adjustment process for anyone, for example, to check the correct placement of LEDs in electronics or for the recognition of color coding in the automotive sector. With version 2.10 of the VeriSens Application Suite, the ID510, XF700/800 and XC700/800 vision sensors benefit from numerous software expansions. SFTP ensures secure communication, from image processing to image storage. With HTTPS, the encrypted connection is supported through a web interface. For the XF700/800 and XC700/800 monochrome models, real-time correction is available for distortion, shading and perspective bias. 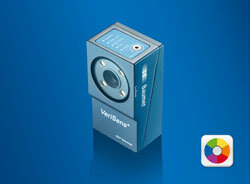 This allows exact image analysis even when the VeriSens is installed at an angle. This also opens up the necessary space for robot access to objects without colliding with the vision sensor, for example. The corrected image resembles a bird's eye view and allows the exact positioning of a robot gripper, or precise dimensional checks. In addition, the new image tool “Find object positions” is specially designed for pick-and-place applications. With this, the vision sensors can detect multiple objects at the same time, including optional testing for overlapping, as well as for free space for grippers, and can provide the positions for robot access. All of the new features can be easily set up through the uniform Application Suite user interface to suit individual applications. A software update is all that is needed to equip vision sensors that are already in use with the new functions.